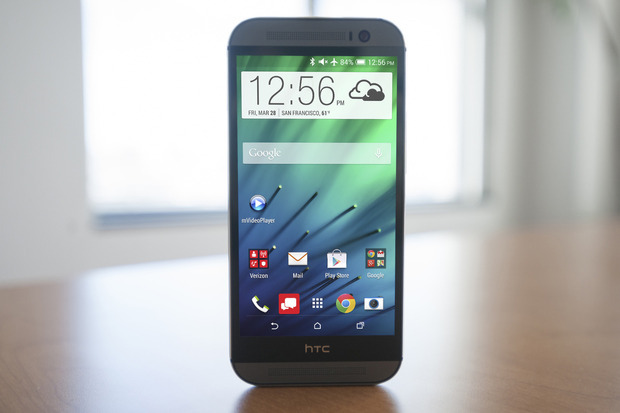 HTC has recently launched their answer to Samsung Galaxy S5 – the new HTC One M8. Well, it has only a few enhancements since the 2013 HTC One M7. But still if you have a juicy paycheck, then this is one of the best devices in the gadget world. There are lots of reviews all over the internet that will easily give 9+ score out of 10 to HTC One M8. But still there are minor flaws, which we will definitely talk about later. HTC One M8 showed off a 5 inch full HD display 1080X1920 ~441 PPI density, which is remarkably awesome and protected by Gorilla Glass 3. Powered by a Snapdragon 801 Quad Core Krait 400 processor and graphic is dealt with an Adreno 330 GPU. But still RAM is only 2GB, it should be at least 3GB as per current Flagship device markup. When it comes to Camera HTC One M8 has a dual 4MP ultra pixel camera, although it’s good, but still inferior when compared to Sony and LG camera devices. 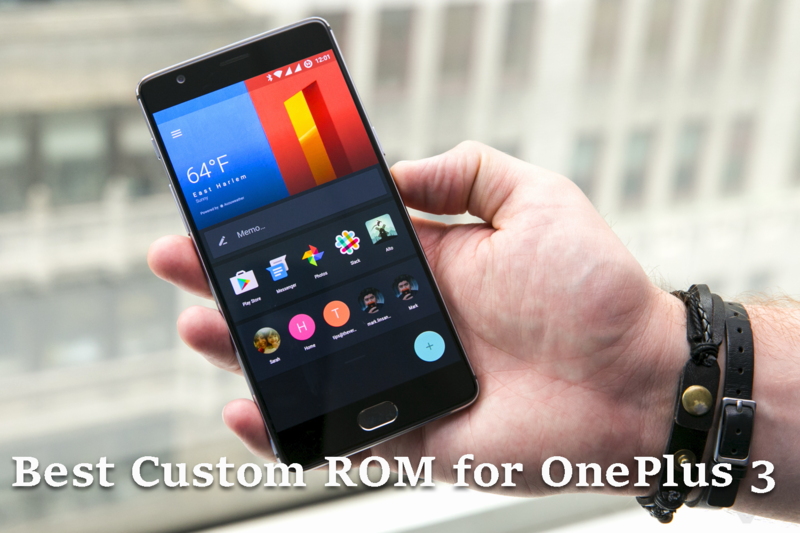 I am here to tell you about the best custom ROM available for HTC One M8. You will need to unlock the bootloader, get root access and install a custom recovery to install the ROMs. Update: HTC has already provided One M8 user an upgrade to Android 6.0 Marshmallow firmware via OTA. You will need to unlock the bootloader using the HTC Dev website and fast boot. You can then Flash TWRP recovery or CWM recovery using fast boot. Just download the img file from above links and then flash to your device using the command “fast boot flash recovery Desktop/openrecovery-twrp-2.7.0.2-m8.img”. You can easily unroot your device with this Stock ROM. Just flash this ROM and you can get back to stock firmware. S Team Marshmallow ROM for HTC One M8: HTC one M8 users received a Marshmallow which was not much satisfying as there were some minor bugs and performance issues. Xda forum members have launched an updated that is a port of HTC 10 ROM to One M8. There are 2 versions of this ROM. One is based on HTC 10, sense 8 and HTC 10 Dolby boom sound the another one is debloated and customizable via Aroma installer. Doppelkänger M8 GPE+ 5.0.1 ROM for One M8: Many developers are working on Android Lollipop custom firmware for HTC One M8. 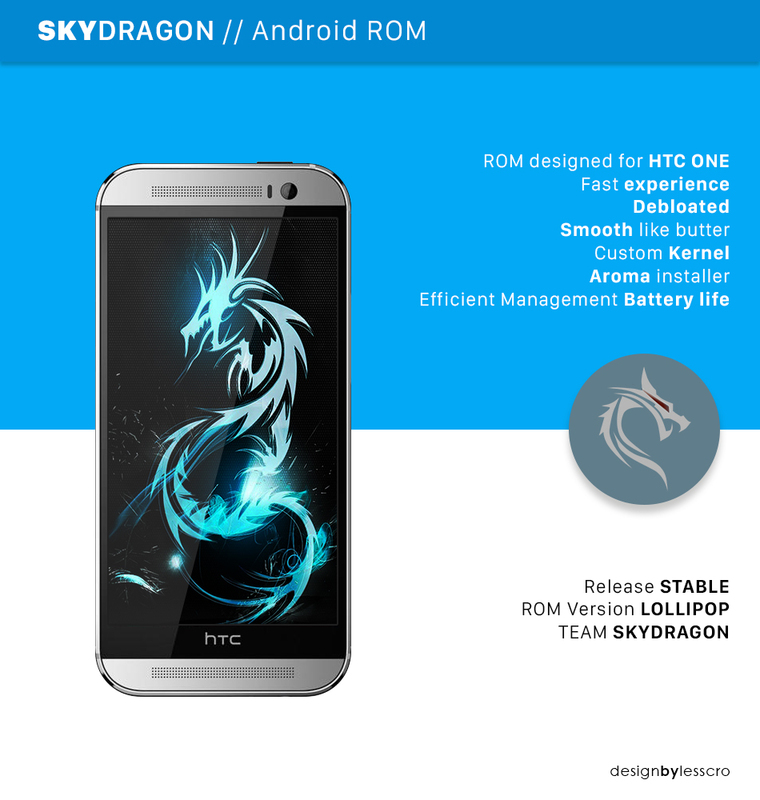 We have already told you about Skydragon ROM with Sense 7.0 Support. Another stable Lollipop Android 5.0.1 ROM available for One M8 user is Doppelkänger ROM. It supports CDMA devices as well and users are loving it for CyanogenMod features add on. The ROM has a dark material theme, with lots of settings and optimizations. You will get CyanogenMod apps like audio fx, calendar, browser, File manager, music, gallery etc. SkyDragon – Android 5 + HTC Sense 6.0 Lollipop ROM – HTC One M8 users must be searching for a Sense UI based Android 5.0 Lollipop ROM. Kudos to Xda forum member dragon SDE nano for the latest addition to HTC One M8 community. He has just introduced an Android 5.0.1 Lollipop based ROM for GSM version users. This is made from Scratch and feature latest HTC sense 6.0. The ROM is debloated and tweaked for fast performance. You will get the latest HTC sense and Google apps. The kernel is modified for better battery backup and performance. There are lots of tweaks and the list can be found on ROM thread. Update: Skydragon ROM has been recently updated and now features Sense 7.0, developers have added support for CDMA, Sprint, and Verizon devices. Based on Android 5.0.2, it’s one of the most updated stable ROM. ViperOneM8 Android 4.4.2 KitKat + Sense 6– HTC One M8 is a powerful device but when paired with a well optimized ROM it can turn into a beast. ViperOneM8 is a stock Android 4.4.2 Kit Kat based ROM and has Sense 6 UI. Venom team has packed lots of tweaks and controls in the package. You will get Venom ROM exclusive features like Venom Pie, Hub, OTA, File Manager, Theming, CPU manager, 3 Finger Gesture, Horizontal – Vertical extended settings. This ROM is fully stable and without any bugs, the users who have tried this ROM have reported smooth UI and faster performance. Besides that, some users also added that this ROM has better battery backup than stock firmware. 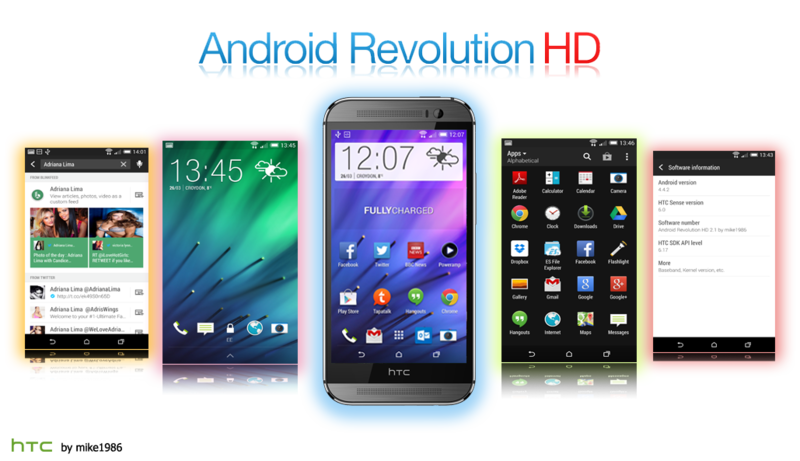 Maximus HD ROM for HTC One M8: You are searching for custom ROM for HTC One M8 that can get you Amazing battery life with fast performance. Try Maximus HD, This ROM is built by a team of developers that are already known for their work. Based on latest HTC One M8 RUU so the ROM is stable and without any bugs. The ROM is deodexed, Zipaligned and pre-rooted for best performance. There is an option to remove Bloatware or unwanted apps, Option to install extra mods. Android revolution ROM are well known on Xda forum. Legendary Xda developer mike1986 has already cooked revolution ROM which was quite awesome and features packed for HTC Devices. This time, they have produced a great ROM which is rock stable and fluid performing on HTC One M8. The ROM is based on latest HTC One firmware Android 4.4.3 Kit Kat, fully optimized and tweak for minimal HTC Sense 6.0 interface and stock look. Full snapdragon rendering, RAM tweaks, virtual memory makes its lot faster than stock ROM. Bloatware has been removed, the ROM is fully zipaligned and de-odexed for smooth performance. You will get an enhanced battery life and EXT4 performance.